The political opposition in the Democratic Republic of the Congo (DRC) has accused DRC president General Joseph Kabila of high treason, after it was discovered that Rwandan government had maintained hundreds of Rwandan Defense Forces on the DRC Territory. Now the question is whether Joseph Kabila violated the DRC constitution and is guilty of high treason against his own country. Maybe he is not a traitor or he is. It is a judgment to be made by Congolese citizens. Meanwhile, AfroAmerica Network has a copy of a secret telegram that confirms what Joseph Kabila did with the Rwandan Special Forces. Before our readers learn about the content of the secret telegram, it is important to recall the facts. of DRC Speaker of the parliament Vital Kamerhe, and a close ally and the architect of the presidential elections in 2006. Vital Kametrhe eventually created his own opposition party and unsuccessfully ran against Joseph Kabila in November 2011. AfroAmerica Network has already shown that Joseph Kabila’s government signed a Secret Accord with Rwandan Government to hunt down Rwandan refugees, including those who had voluntarily disarmed and regrouped in Kasiki, North-Kivu. Actually, there is more: as mentioned above, AfroAmerica Network has a copy of secret telegram, from the FARDC military leadership, giving instructions to the unit commanders how to work with the Rwandan Special Forces. The telegram, numbered: SECRET NO 0171/OPS AMANI LEO/COORD/G3, was sent by General Dieudonne Amuli Bahingwa, Commander of Operation Amani, on December 29, 2010. General Amuli Bahingwa sent the telegram to FARDC COMD Nord-Kivu and Sud-Kivu with copies to CHEFEMG-CHEFEM FT- COMD 8-10 RGN MIL, obviously the Chief of Join Military Staff, Chief of the Army, and Commanders of 8, 9 and 10 military divisions. The telegram, a copy of which was obtained by AfroAmerica Network in January 2011, instructs the commanders of North and South Kivu to identify elite troops that would work with Rwandan Special Forces. Specifically, General Amuli Bahingwa says in the telegram that he is acting under the orders of the Chief of the Joint Military Staff and following a secret meeting between the Rwandan and DRC military leaders in Kigali, on November 2, 2010. He is asking that most of the Congolese Special Forces to joint their Rwandan counterparts be composed of 60% from FARDC and 40 % from CNDP and PARECO. CNDP was and still is, after transforming itself into M23 rebels, a proxy rebel group founded, funded, armed, trained and reinforced by Rwanda Defense Forces leaders. Hence, if one adds all the special forces troops composing the entire AMANI Leo, the FARDC represented 30%. This means that Rwandan Special Forces and their proxy rebels or militias represented close to 70% of the combined forces. FARDC troops were a small minority of the troops supposed to protect the DRC. In the telegram, it is also specifically said that military and other equipment had to come from FARDC central command. AfroAmerica Network’s copy of the official telegram includes hand written comments from FARDC commanders and members of the Joint Military staff, especially the OPS ( military operations) commander and J2 (military intelligence). Regarding the pay to and other financial incentives for Rwandan Special Forces, AfroAmerica Network has information on how the money was sent to General Bosco Ntaganda, the CNDP commander and an accused war criminal, by a Congolese official in monthly installments on the orders from Joseph Kabila. 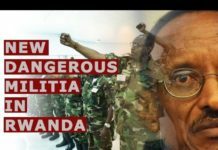 AfroAmerica Network has also detailed information on how Rwandan Defense Minister James Kabarebe was given, by General Joseph Kabila himself, the right to import goods from the DRC through the Bunagana border, without paying any tax or being subjected to customs and border control. The detailed information on the movement of money from DRC government to CNDP may be published in our upcoming articles. Watch this site. Whether Joseph Kabila can be accused of high treason or not, the telegram and other information confirms the dirty game between Rwandan Paul Kagame and Congolese Joseph Kabila; a dirty game that most Congolese may not be aware of. Previous articleTHE HAUNTING SIMILARITIES BETWEEN THESE AFRICAN FIRST LADIES WHO ARE ACTUALLY VERY CLOSE FRIENDS IN PRIVATE….